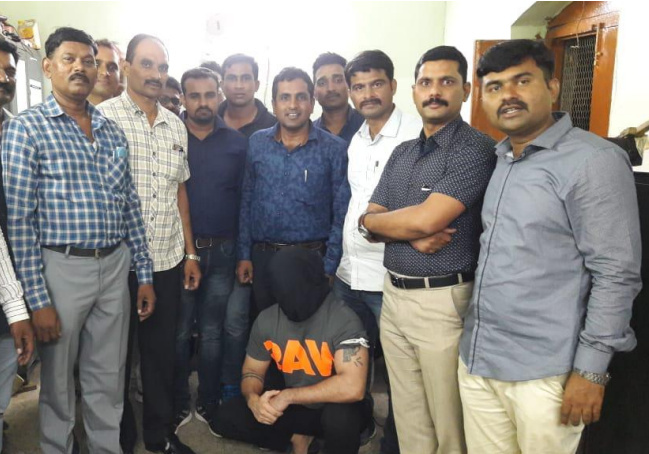 Nagpur Crime Branch with absconding gangster Sumeet Thakur (sitting). Nagpur Crime Branch, on Friday evening, nabbed absconding gangster Sumeet Thakur from his girl friend’s house in Gittikhadan area in the city. Thakur, who in past has been booked for various offences under relevant sections of MCOCA (Maharashtra Control of Organised Crime Act, 1999) and the IPC, was wanted for allegedly firing on three persons in June. On Friday, the cops got a tip-off that Thakur was hiding at his girl friend, a beauty pageant winner, Urvashi Sakhare’s residence in Gittikhadan. Post the tip-off, API Bobde and API Bedodkar kept a close look on the house. On being sure that Thakur was indeed at Sakhare’s residence, crime branch raided the house and started looking for Thakur. The gangster was finally nabbed from a wooden cabinet in Sakhare’s room. Thakur was later handed over to Gittikhadan Police Station by the crime branch officials. Gittikhadan Police, On Saturday, presented Thakur in front of the court, which remanded him to police custody till August 9.